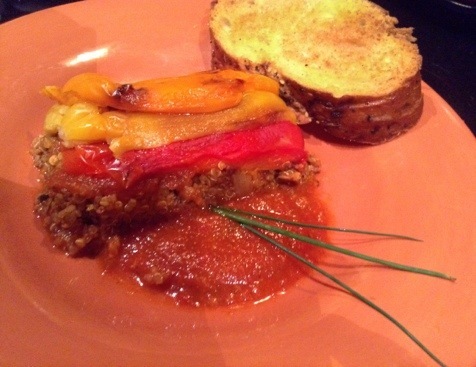 As far as I know, everyone loves baked stuffed sweet peppers. During my childhood, my mother would make a “home-style” version with tomato ketchup, white rice, and hamburger baked inside bell peppers which I really enjoyed. Now that I am an adult child, my tastes might run a little more sophisticated ingredient wise, but there’s still no beating the classics. 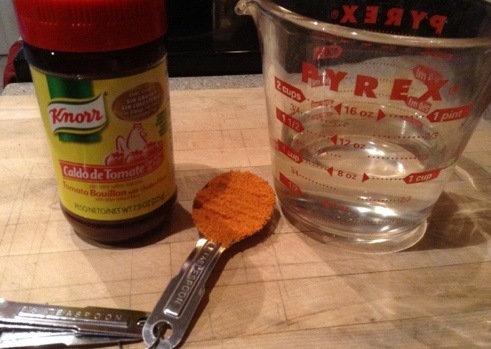 Over the years, I’ve made many attempts at modernizing this recipe. I have used ground chicken, pork, and/or beef; and I suspect there’s a veal or lamb stuffed pepper recipe out there with my name on it! 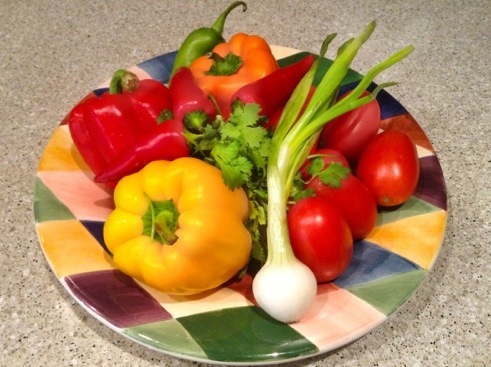 In fact, I cook with peppers so often (either attributed to the southwestern flavor I lean toward or indicative of the availability of fresh produce here in Phoenix), that coming up with new and tasty ways to utilize them has become a regular challenge. A medley of peppers and vegetables. Just look at that gorgeous color! Deconstructing Stuffed Sweet Peppers (or anything for that matter) is a different approach for me, but one that really just makes sense. Aesthetically, it changes the whole appearance of a finished dish, which is in itself cool, and it pushes me out of my comfort zone. 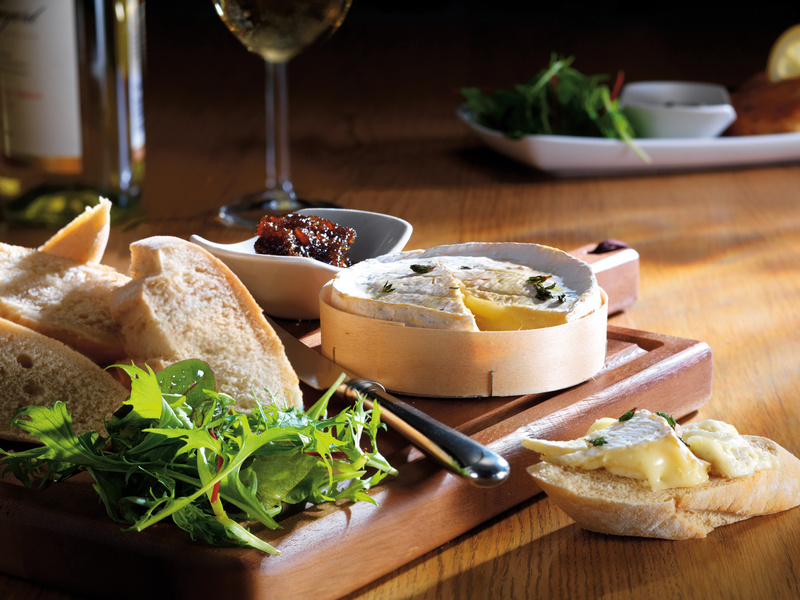 Some have said cooking a deconstructed dish is easier and faster. With this dish, I did not personally find that to be the case; the prep was as involving as any other recipe. If anything, by roasting the peppers first, I noticed they possessed a decidedly sweeter flavor that really popped and contrasted with each forkful of the stuffing and tomato and roasted pepper sauce. And the vibrancy of the final presentation, well…my partner and I absolutely loved it! 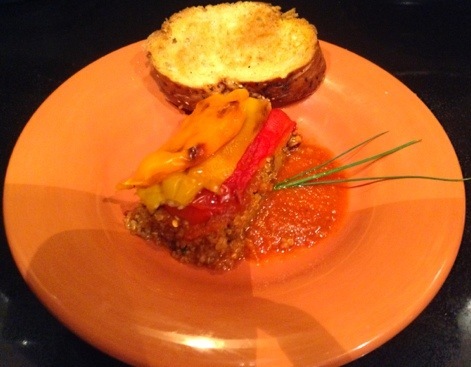 I wanted a slightly more edgy, upscale rendition of stuffed peppers and this was a winner; if I do say so myself. As some of you may know, “deconstructed” dishes are all the rage lately; especially with renowned Top Chef and Kitchen Challenge contestants (oh yes, I watch and adore those shows too). If you Google “deconstructed food meaning,” you’ll probably be as amused by the some of comments and pseudo-definitions as I was. One commenter on ChefTalk referred to it as “pretentious chef-speak…invented to elevate the dish.” Crude but I don’t necessarily disagree. And I’m not nearly an expert enough to offer a technical definition, but in my opinion “inside-out blah blah” comes pretty close. That said, this particular deconstructed recipe is more or less my own. However, the inspirations for it certainly deserve acknowledgement. So thank you, Renee from Eat. Live. Blog. 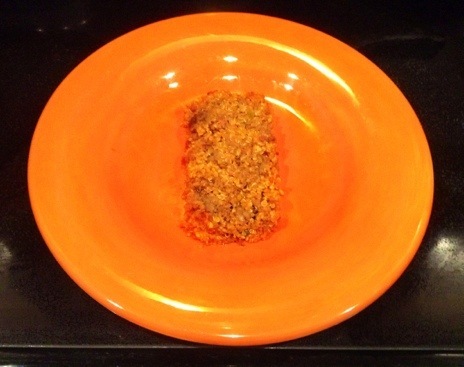 and Pintrest author, Jonathan LaChiana, on Pinterest for posting/pinning your recipes of deconstructed stuffed sweet peppers. 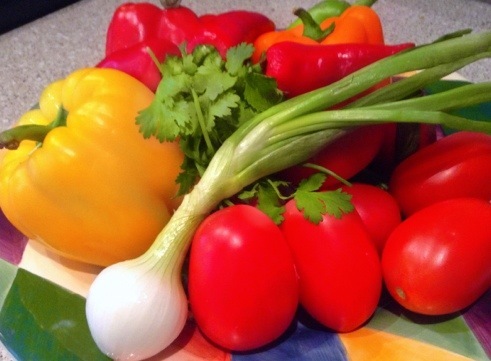 Arrange peppers on baking pan or cookie sheet. Turning the peppers every few minutes, roast thoroughly until peppers are soft and have darkened on each side. 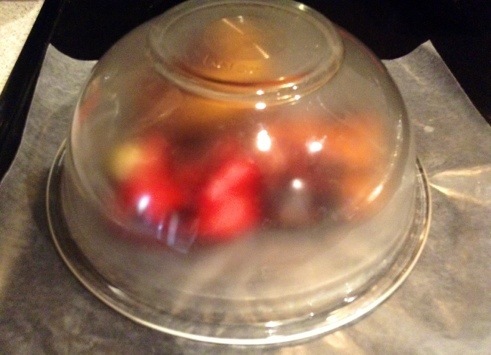 Remove from oven and place peppers beneath a glass or plastic bowl to sweat them. 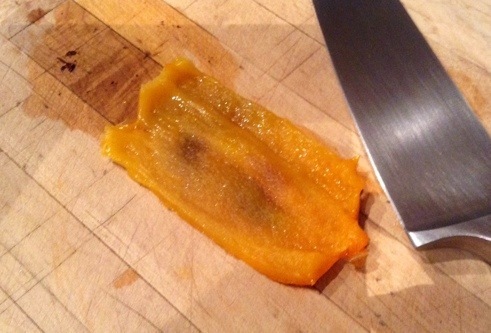 Remove charred skin from each with a paper towel then slice open to remove stem and seeds. 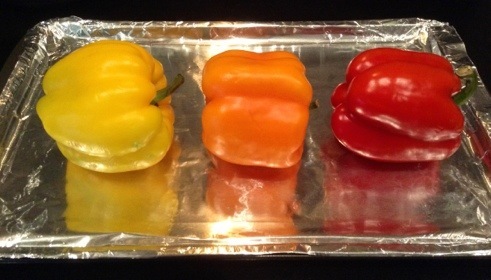 Spread peppers out lengthwise and cover with foil to retain heat until ready to utilize. 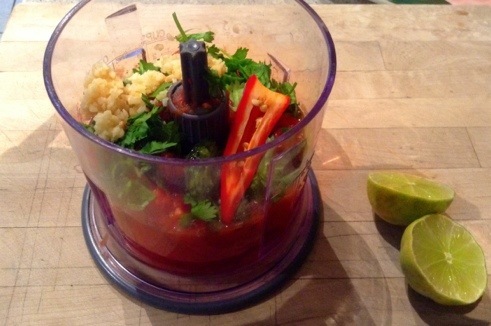 Add tomatoes, cilantro, garlic, seeded jalapeño, basil, and lime juice to a food processor. 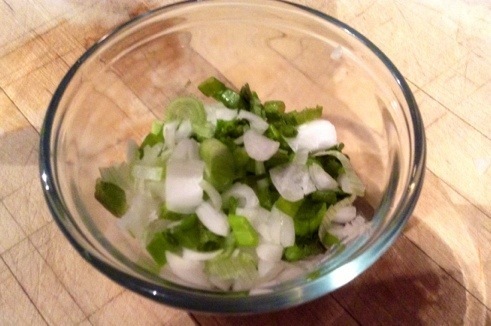 For a spicier sauce, add more jalapeño or leave in seeds. Blend until reduced. 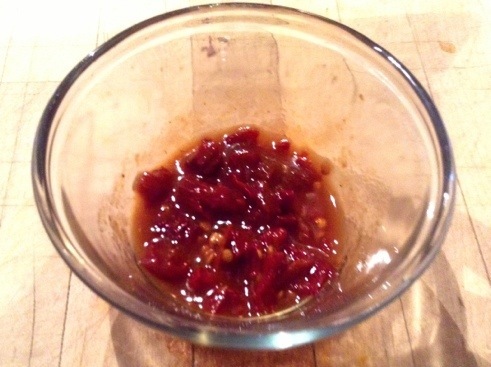 Toss in peeled roasted peppers and olive oil, then blend until purée is smooth. 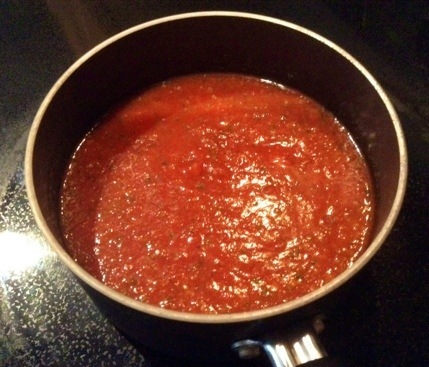 Pour into a medium sauce pan, add tomato stock, stir and simmer on medium-low heat for 20 minutes. Cover and aside until ready to use. 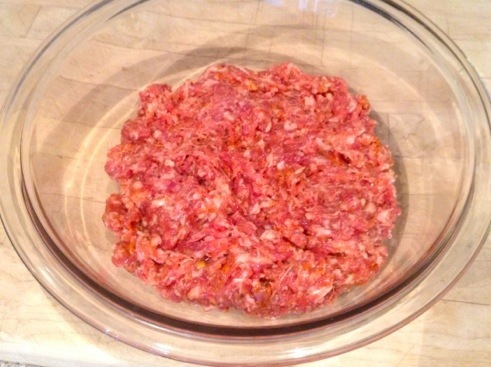 Mix both types of sausage together in a large bowl. Dice medium-sized chipotle pepper with adobo sauce and combine with sausage using a fork. 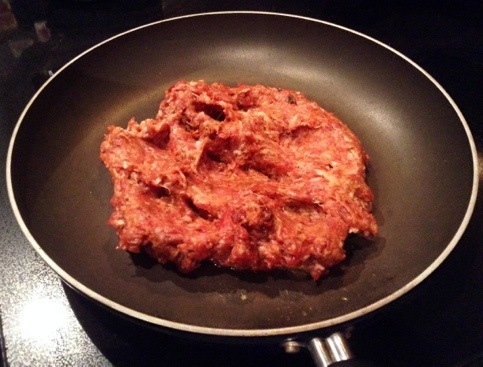 Transfer to a large skillet, browning the sausage until it crumbles easily using a spatula. 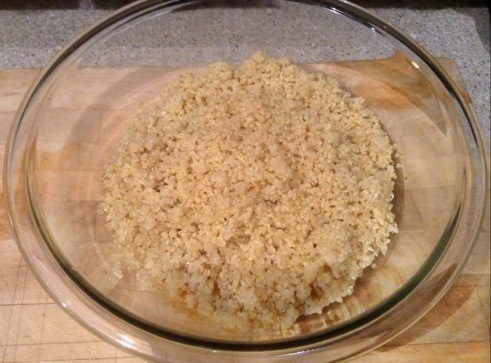 Boil quinoa in a medium sauce pan (1 cup quinoa = 2 cups water). 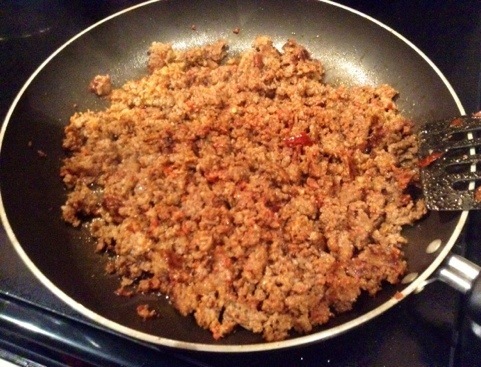 Add cooked quinoa and roasted pepper sauce to sausage and cook on medium-low heat. 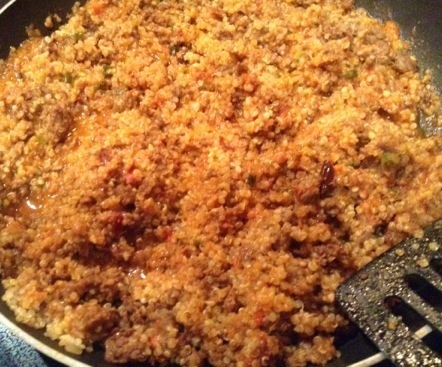 Layer cooked quinoa and sausage stuffing with 1 tbsp. of pepper sauce. Slice roasted peppers and place onto sauce in layers. Add sauce to plate on side. Dice the chipotle in a cup or small bowl using a small knife and fork. Be careful to avoid hand-to-eye contact. 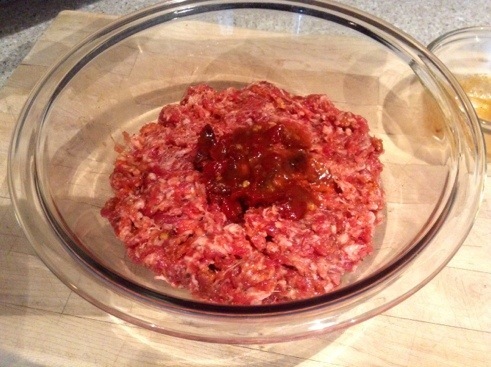 …until completely incorporated into the meat. 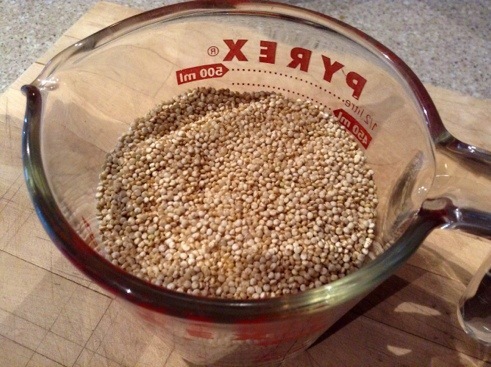 Boil one cup of quinoa and two cups of water in a medium sauce pan (the quinoa will swell when fully cooked i.e., when there’s no more water). Pour into a bowl and set aside to cool . 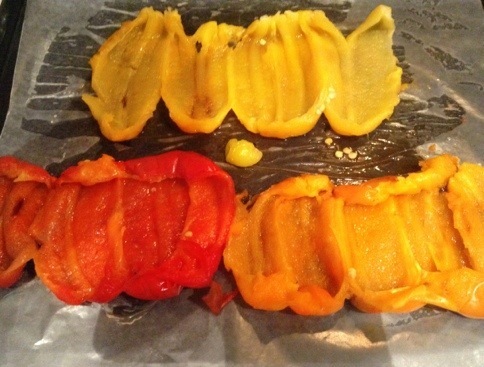 Arrange the peppers on a foiled baking pan or sheet. Roast the peppers in a 400 degree oven for approximately 20 minutes, turning every few minutes as skin starts to darken on each side. 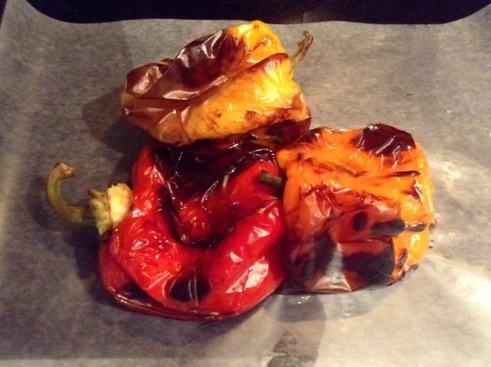 …and place roasted peppers onto a plate or sheet of wax paper. Cover with a bowl (or use a paper bag) and allow peppers to sweat. 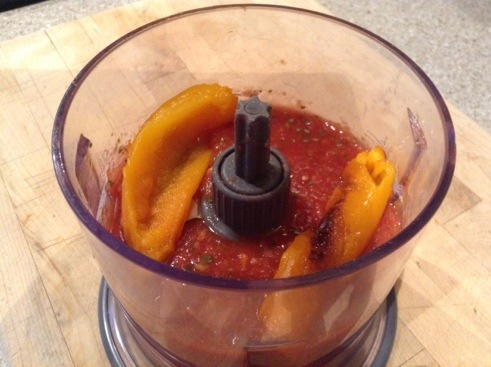 Dice tomatoes and transfer all juice and tomatoes to a food processor. Begin adding the other ingredients: garlic, cilantro, basil, 1/2 or whole jalapeño, squeeze in some lime juice and blend. Once the peppers have been seeded and peeled, spread out into layers. Dab off any excess moisture. Slice off enough peppers to make 1/2 cup (more than what’s pictured below) and add to the food processor with 2 tablespoons of olive oil. And purée sauce until it thickens somewhat. 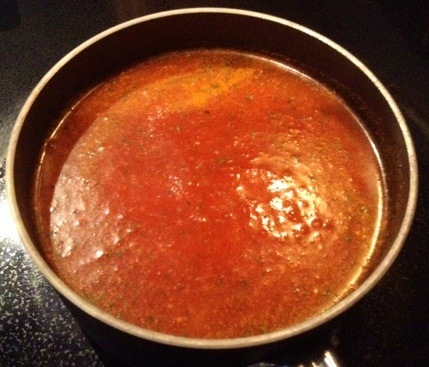 Mix one tablespoon of tomato/chicken bouillon into 1 cup of water. 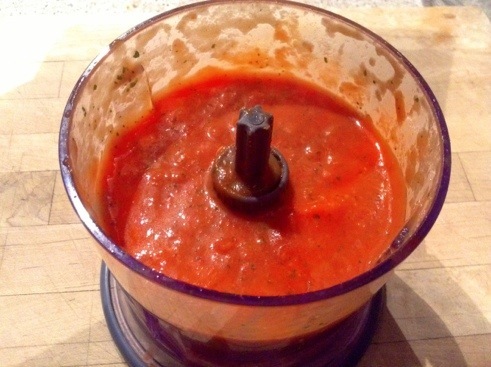 In a medium sauce pan combine vegetable purée and tomato broth. Simmer on medium heat, stirring often, until sauce reduces and thickens. Over medium heat, brown the sausage and chipotles in a large skillet. 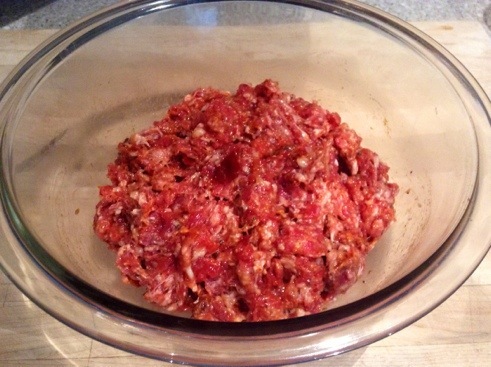 Once fully cooked, remove the sausage from pan and move to a bowl. Dice green onion or shallots. 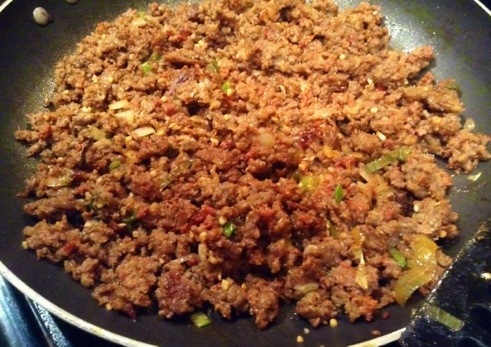 Mix with the browned sausage. Looking for a superfood? Don’t forget the quinoa! 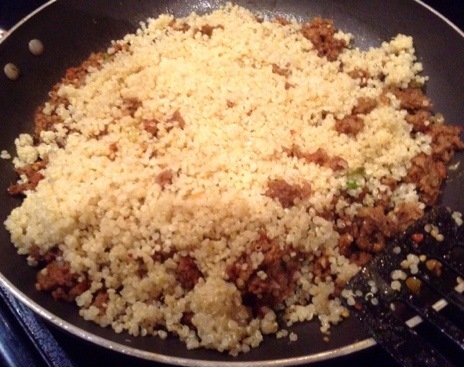 Combine the quinoa with sausage and onion in skillet (still cooking of course). 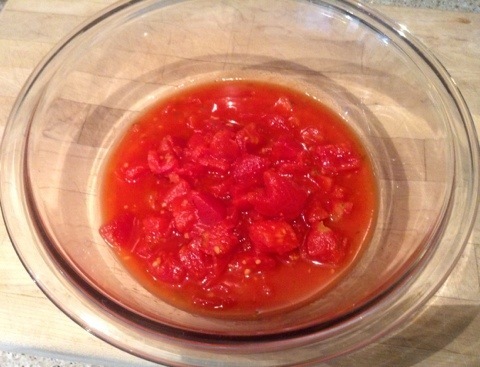 Mix in about a cup of the prepared roast pepper sauce and let cook for a couple of minutes on medium-low. 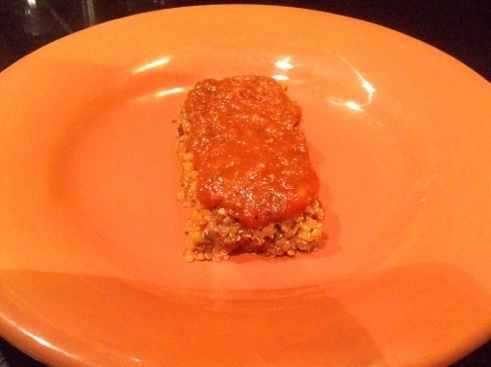 Plate quinoa and sausage by pressing the mixture into a cookie cutter (I used a spoon to shape a rectangle). 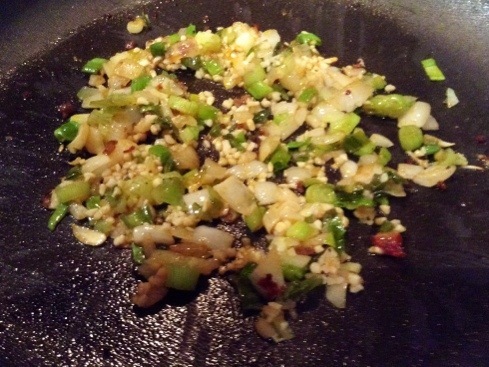 Layer onto the stuffing about a tablespoon of sauce (more if desired). Slice off a couple of appropriately sized piece of roasted pepper and create another layer on top of the sauce and stuffing. And voila! The final plating: Deconstructed Stuffed Sweet Peppers. I hope you enjoy this recipe as much as we did. Bon appetite! Thanks for visiting Geek Eats World. Please leave your comments and suggestions below! Thanks for the shout out! Your version looks delicious too, I will definitely have to try it! My pleasure Renee! That’s quite a compliment coming from you. I hope you find other recipes you like here as well!